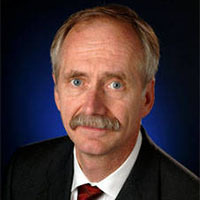 William H. Gerstenmaier is the Associate Administrator for the Human Exploration and Operations Directorate at NASA Headquarters in Washington, DC. In this position, Gerstenmaier provides executive leadership and strategic direction for all aspects of NASA’s human exploration of space programs, as well as the cross-agency space support functions of space communications and space launch vehicles. He directs the continued operation and utilization of the International Space Station, development of the Space Launch System and Orion spacecraft, and strategic guidance and direction for the commercial crew and cargo programs that will provide logistics and crew transportation for the International Space Station. Gerstenmaier began his NASA career in 1977 at the then Lewis Research Center in Cleveland, Ohio, performing aeronautical research. He has held various positions of increasing responsibility with NASA including Shuttle/Mir Program operations manager, Space Shuttle Program Integration manager, and the International Space Station Program manager. Appointed associate administrator for NASA’s Space Operations Directorate in 2005, Gerstenmaier directed the safe completion of the last 21 Space Shuttle missions that witnessed assembly complete of the International Space Station. During this time, he provided programmatic direction for the integration and operation of the International Space Station, space communications, and space launch vehicles. Mr. Gerstenmaier earned a Bachelor of Arts in Aeronautical Engineering from Purdue University in 1977, as well as a Master of Science in Mechanical Engineering in 1981 from the University of Toledo. The National Space Society presents this award to outstanding individuals like Mr. Gerstemaier who share our vision to advance humanity’s presence in space. This award recognizes Mr. Gerstenmaier’s service as Associate Administrator as well as his dynamic career with NASA, which spans 40 years! Throughout his career and for many years under his management, Mr. Gerstenmaier has overseen the development and maintenance of the International Space Station – a blueprint for global cooperation off the Earth. Mr. Gerstenmaier’s indelible contributions to space station operations are helping to facilitate the growth of a robust commercial market in low-Earth orbit (LEO) for scientific research, technology development, and human and cargo transportation. NASA’s Space Launch System rocket, Orion crewed spacecraft, the commercial crew program, and a revitalized space launch complex in Florida were all managed under Mr. Gerstenmaier’s vision and leadership. The best of NASA’s human spaceflight program is yet to come, and that is largely thanks to what Mr. Gerstenmaier and the spaceflight team have done to push the boundaries in space for humans.